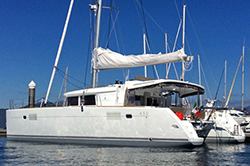 Delicia is a newly launched Lagoon 450 catamaran. 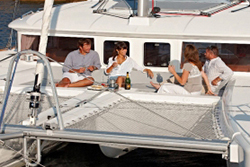 She accommodates eight guests in four equal luxurious queen guest cabins, each with private en-suite wc/shower. whereas Delicia has 4 equal cabins. 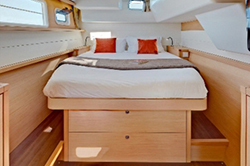 The interior, by Nauta Yachts, is designed to maximize space and volume. When the sliding doors are open to the aft deck, there’s no separation between the interior saloon and the exterior living area and it becomes one big, open space. Luxurious touches throughout Delicia ensures sumptuous comfort.